PRESS RELEASE | BRUSSELS | 7 NOVEMBER 2017 – The INTRAW project consortium announces the official launch of the International Raw Materials Observatory, a new not-for-profit organisation created to support international cooperation in the field of mineral raw materials. The International Raw Materials Observatory is a new not-for-profit international association, created to enhance worldwide cooperation on mineral raw materials’ research and innovation, education and outreach, industry and trade and recycling, management and substitution of strategic raw materials. The Observatory is one of the major outcomes of the Horizon 2020 funded project INTRAW* (2015-2018). Since its start in 2015, the project has mapped best practices on mineral raw materials policies in five reference countries (Australia, Canada, Japan, South Africa and the USA), and advanced a roadmap to foster the EU response to global challenges on mineral raw materials supply. The Observatory has now officially been launched during the EU-Advanced Mining Countries conference, on 7 November 2017, organised in the framework of the European Commission’s Raw Materials Week (6-10 November 2017). INTRAW coordinator Vitor Correia provided the audience with an overview of the services the Observatory will be offering to its members and the marketplace, namely foresight dialogues with key influencers and match-making services for organisations active along the minerals materials value chain. The Observatory will “foster dialogues among stakeholders and policy makers, in the intersection between political actors and society. […] We believe that policy makers need foresight analysis to plan ahead,” said Vitor Correia. During a match-making session organised at the end of the conference, the participants had the opportunity to test one of the other services the Observatory will provide. Mineral raw materials are hence the focus area of the International Raw Materials Observatory and diplomacy, dialogues, independent expert analysis and foresight will be the main tools used to advance international cooperation, informed policy making and better governance of mineral raw materials. The values of the International Raw Materials Observatory are built around the concept of honest broker since it will act as an impartial international mediator specialised in the minerals value chain to support international cooperation and exchange of best practice. *INTRAW is funded under the European Commission’s Horizon 2020 EU Research and Innovation Programme, for a period of 36 months (February 2015 – January 2018). 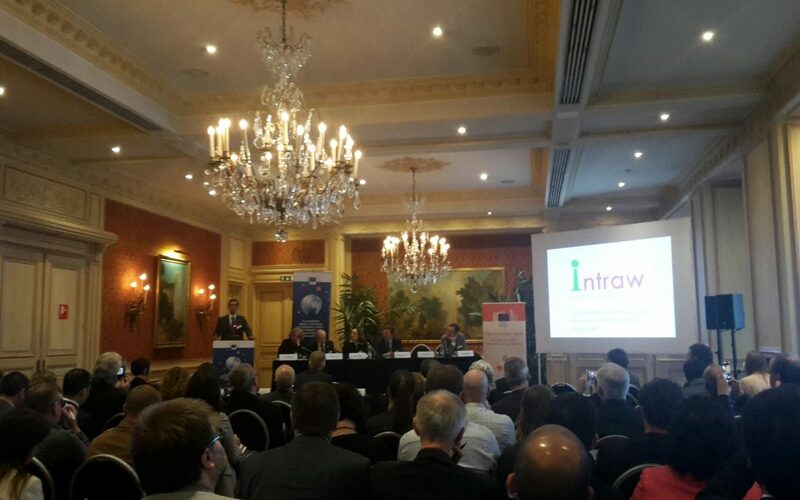 Under the coordination of the European Federation of Geologists (EFG), INTRAW brings together an international consortium of 15 partners with extensive experience in research, innovation, education, industry, trade and international networking across the entire raw materials value chain. INTRAW also counts on the support of 24 third parties and more than 40 experts from across Europe, Australia, Canada, Chile, Japan, South Africa and the United States.